Growing in number and spirit, the Standing Rock Sioux protest against the Dakota Access Pipeline is swiftly gaining strength ahead of a federal hearing on the controversial project. Support has spread across the country, and thousands have descended on the peaceful "prayer camps" in recent days, prompting state officials on Monday to remove the demonstrators' drinking water supply. North Dakota homeland security director Greg Wilz ordered the removal of state-owned trailers and water tanks from the protest encampment, despite the sweltering heat, because of alleged disorderly conduct, according to the Bismarck Tribune, including reports of laser pointers aimed at surveillance aircraft. "People are getting overheated now already," said Johnelle Leingang, the tribe's emergency response coordinator, as temperatures hovered around 90º F on Monday. "It's very hurtful." 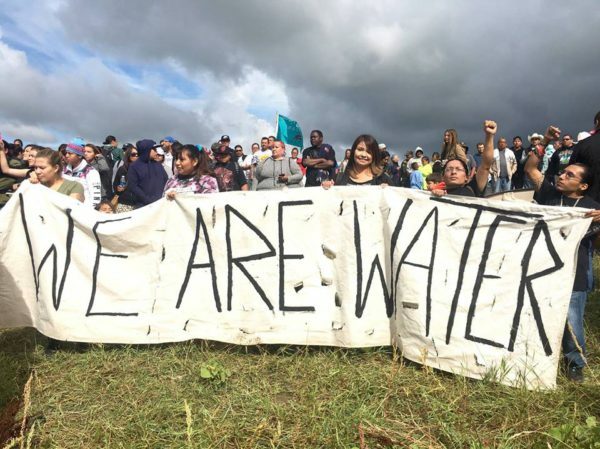 The supplies were provided last week by the North Dakota Department of Health at the tribe's request to support the roughly 2,500 people now gathered along the Standing Rock reservation's border on the Cannonball River, near where the pipeline is slated to cross. Standing Rock spokesman Steven Sitting Bear said he's received "notifications from tribes all over the country that have caravans in route, so it’s continuing to grow." On Wednesday, high profile activists and supporters are rallying in Washington D.C. outside the U.S. District Court, where members of the Standing Rock Sioux will argue that the U.S. Army Corps of Engineers granted Energy Transfer Corporation approval for the 1,172-mile pipeline without tribal consent. The tribe says that the pipeline—which will carry up to 570,000 barrels of fracked Bakken oil daily across four states to a market hub in Illinois—puts the sacred waters of the Missouri River at great risk. Climate campaigner and 350.org co-founder Bill McKibben penned an op-ed on Monday titled "After 525 years, it’s time to actually listen to Native Americans." McKibben notes that in recent years Indigenous people like the Standing Rock Sioux "have been the vanguard of the movement to slow down climate change," and offers a vision of "what it might mean if the if the Army Corps, or the Obama administration, simply said: 'You know what, you're right. 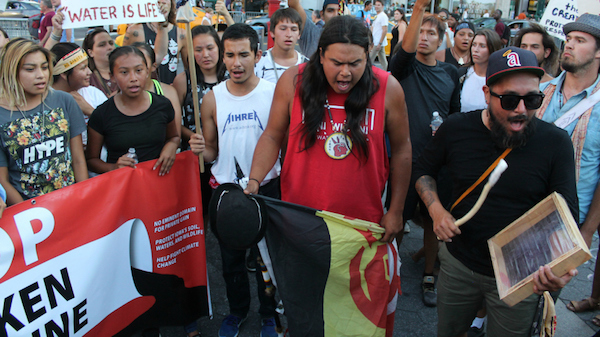 We don’t need to build this pipeline.'" One has the ominous sense of grim history about to be reenacted at Standing Rock. North Dakota authorities—who are in essence a subsidiary of the fossil fuel industry—have insisted that the Sioux are violent, that they have "pipe bombs." There are rumors about calling in the National Guard. The possibility for renewed tragedy is very real. But the possibility for a new outcome is there as well. The Army Corps of Engineers might back off. The president might decide, as he did with Keystone, that this pipeline would "exacerbate" climate change and hence should be reviewed more carefully. We might, after five centuries, actually listen to the only people who've ever successfully inhabited this continent for the long term. Construction on the pipeline remains halted after developers paused the project last week in anticipation of the Wednesday hearing. Meanwhile, a U.S. District Court hearing on whether a preliminary injunction should be issued against the protesters has been rescheduled from Thursday to Sept. 8, although a restraining order against the demonstrators has also been extended until then. Filing the order on Monday, U.S. District Judge Daniel Hovland wrote that factions are '"strongly encouraged to meet and confer in good faith' to try and resolve the dispute out of court," the Tribune reported. Updates are being shared on social media with the hashtags #NoDAPL and #RezpectOurWater. This article was first posted on commondreams.org. Lauren McCauley is a staff writer for Common Dreams. They need to put it to a constitutional challenge. Claim the land as a religious institution and their point of prayer and that pipeline would be sacrilege. They need to have a proven history of that religious affiliation and with that land as their church, as such the work would have to be stopped, to adhere to the requirements of the constitution. Forget treaties the US government routinely breaks treaties, not worth the toilet paper they are written on, the land needs to be locked up via religion and the constitution. The growing pipeline demonstration should prompt calls for a rising carbon tax. The tax would be efficacious in plugging the pipeline.